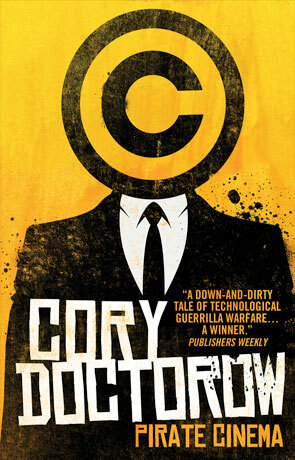 Cory Doctorow has a unique way of capturing the technological challenges of current times that speaks volumes, provocative and blended perfectly into an entertaining, rewarding story. Pirate Cinema is no exception and the fact that it is labelled as a "Young Adult" book should not put the older reader off in the slightest, this is daring, rewarding fiction for any age group. It's worth noting the whole premise of the book, that a law is passed allowing Internet Service Providers (ISP's) and the government to block access to the internet for "copyright infringement" was very close to becoming reality last year with the Stop Online Piracy Act (SOPA) and Protect Intellectual Property Act (PIPA) laws that were almost passed (but thankfully defeated) in Parliament. Doctorow examines the potential of what could happen should a similar law be passed in the future. It's also about how such a law could stiffle creativity, after all most art is "inspired" to some degree by something that already exists. highlighting one of the real issues in this country - that technological laws are often being passed by people who don't really understand the technology or worse still are happy to take cash to pass a bill. This year they are once again trying to instil this form of censorship masqueraded as "protecting" us from bad things on the net - we may yet see the great firewall of Britain. The issue of Copyright is a complicated one, complicated further by the heavy handed nature of the rich media corporations who want to control such restrictions. I personally don't "download" copyright material and yet I feel burdened by this ridiculous notion that downloading some electronic media is the same as stealing from a shop or house (it might be wrong but it ISN'T the same). It annoys me that having bought a DVD (yes I still buy physical DVD's) I am often forced to sit through a clip you can't skip explaining the horrors of piracy - it's like a shopkeeper lecturing someone for 5 minutes on the consequences of stealing after they've paid for an item before they are allowed to leave the shop. I've yet to see any evidence that a single sale has been lost due to "downloading" any copyright material and most research suggests that the vast majority who download buy more than those who don't. One of the points Doctorow is making here is that the law of theft in this country is all about "intent", if you leave a shop without paying for an item a prosecutor must prove that there was clear "intent" to leave without payment. The 16 year old protagonist of Pirate Cinema (Trent McCauley) downloads films so he can create his own mash-up films from short clips, there is no "intent" to defraud anyone, the resulting films are not sold for profit and it's quite clearly a modern form of art. Most of the films are dedications to his favourite actor - a form of "fan-fiction". Yet he is still persecuted by the Draconian values of the piracy law; his whole family suffer by being cut off from the internet for a year. While it is still possible to survive without the internet right now it's fast becoming difficult to do so, public services are going online only while people have jobs and careers that are completely dependant on internet access (myself included). as far as students are concerned it's becoming increasingly important to use the web for research and study support. Fast forward a few years from now and we are only going to increasingly dependant on this global network. As such restricting a whole families access to a required service just because one household member broke a law is almost the same as putting them all in prison, and yet this almost came to pass (it's still possible it could happen in the future). This leads me to another point, it is a fact that technology is generally better understood by the younger generation; yet laws are largely passed by an older generation and this presents a serious problem. Such laws like SOPA and PIPA are written for commercial reasons, not the betterment of the country and yet are (nearly) passed by people who don't fully understand the technology or the consequences. Worse still some are even passed for the sake of money. In other words, they managed to actually pass a law that makes it illegal to use any and all devices that share network connectivity. Anyone say Doh? Anyway what Pirate Cinema does is highlight these issues (and others) in a rewarding story that really does grip you from beginning to end. It's smart, it's easy to read and it explains the issues in such a way that even the most severe technophobe (or even politicians) should be able to grasp why blanket piracy laws are such a bad idea and how with just a few poor choices by our countries decision makers we could be living in a dystopian reality with a severely restricted freedom. The pace is steady and the characters engaging; Doctorow makes good use of English colloquialisms and banter to create a feeling that is quite British in nature (even if it does re-enforce the stereotype that northern cities are rougher than the south) - not bad for an author who's native country is Canada. Despite the dystopian air and backdrop of Londons homeless the book has a positive air about it, it's a message of the positive power of people and how one person regardless of background can have a marked effect on their country. I must admit that I did found the depiction of homelessness a little unrealistic, or at least over-simplified however this was a minor irritation. Pirate Cinema is a stark reminder that we shouldn't take our freedoms for granted, that we shouldn't let laws be passed by greed, corruption or by people who don't understand what they are passing. It's a reminder that we do need a clearer understanding of copyright and ownership in the digital age and without such guidance most of us will suffer. It does however have a more positive message too though, that we can make a difference and that standing up for ones beliefs can change things for the better. Written on 6th August 2013 by Ant.